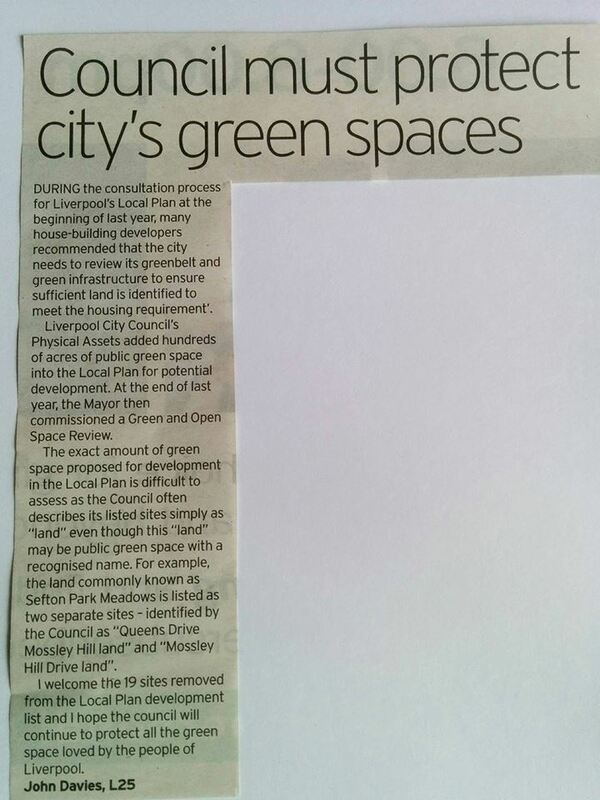 ……and Liverpool City Council finally publishes its Draft Local Plan – giving NO PROTECTION to greenspaces…..
Simon O’ Brien and Mayor Joe Anderson launch the long awaited Green and Open Spaces Board’s Interim Report in this Liverpool Echo article. 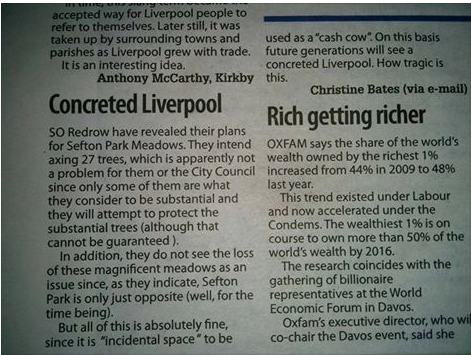 Not good news for Sefton Park Meadows. 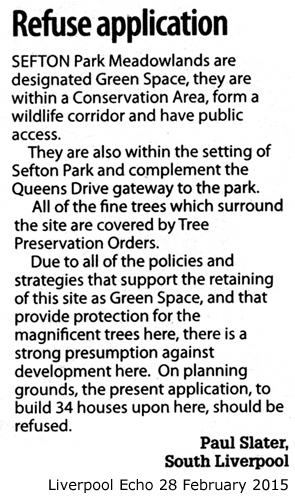 How is this heritage greenspace in Sefton Park ‘ incidental land’ Simon? WATCH – Save Sefton Park Meadows Campaign on BBC One Inside Out North West on 5th October. Feature as part of an article on how active retired women are getting involved in environmental campaigns. 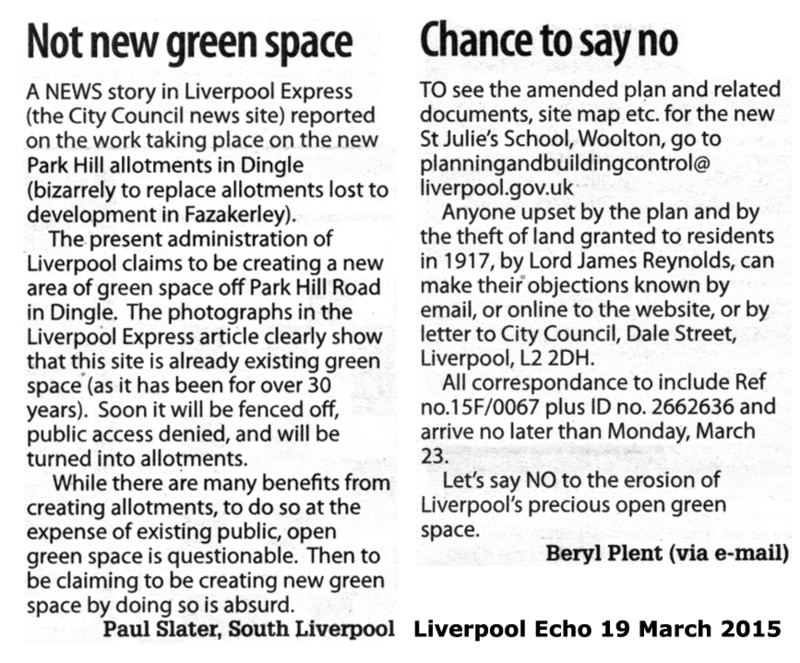 Interview starts at 01:13:20 and finishes at 01:18:34.
Letters in Liverpool Echo re Liverpool Local Plan and removal of 19 greenspaces from their current development list. Why isn’t Sefton Park Meadows or Walton Hall Park on this list? Place North West Redrow 29 June, which highlights a new Redrow Homes NW appointment to manage Liverpool building projects and Liverpool Echo online is the same article but omitting mention of the new satellite Redrow office within the council’s Cunard Building. 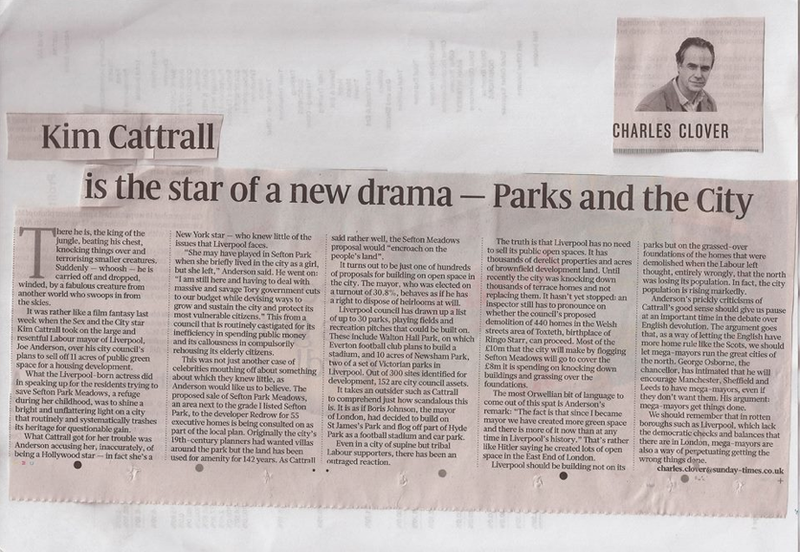 Interesting article re public parks and the threats to them, the Guardian 27th June. 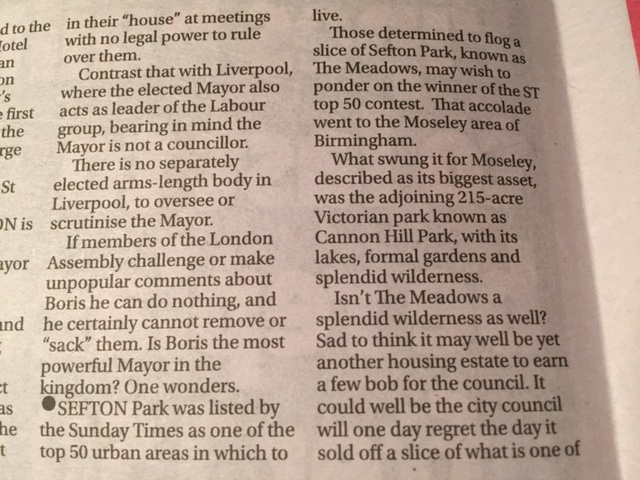 Sefton Park Meadows are mentioned. Liverpool Head of Planning David Hughes shows the council’s hand with statement about ‘ need to build on greenspaces’ at a conference in Manchester. See Liverpool Echo report from 12th June. Well done Jonathan Brown from Merseyside Civic Society for his response. Second year medical student Lizzy Lourenco wrote a great article in the University of Liverpool Student news, following a talk given by vice chair Janet Pell at the Guild. Gives good reasons why young people should support our campaign. Green Party Leader Nathalie Bennett visited Liverpool on April 26th and pledged support for protecting our natural world. See Liverpool Echo. Kim Cattrall speaks up again for the Meadows – this time on BBC Woman’s Hour on 24th March in conversation with Jane Garvey (@10m.5 secs). Kim, your support is really appreciated! 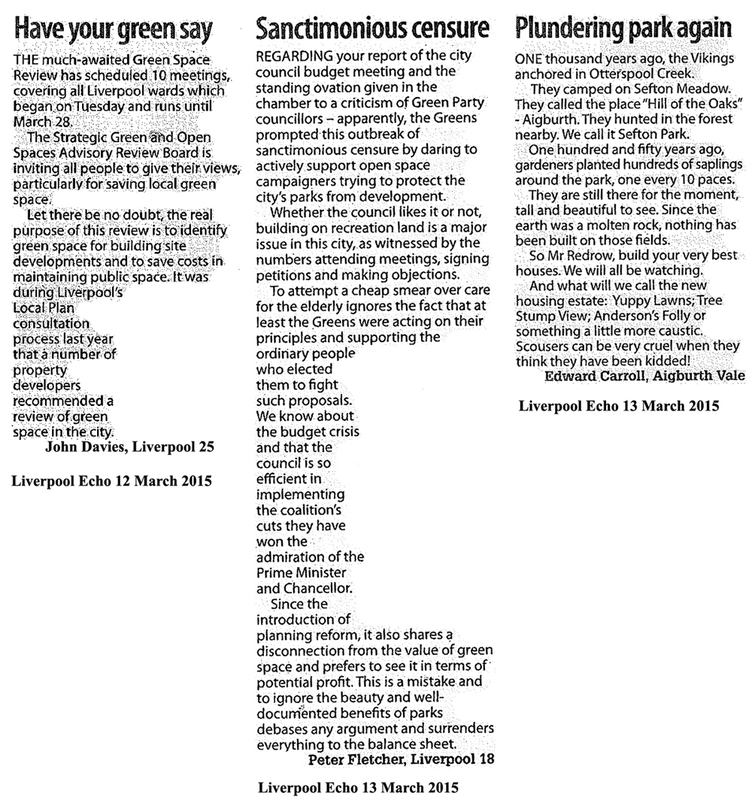 The Liverpool Echo also covered this in ‘ Why are they taking our parks away?’ on 25th March. 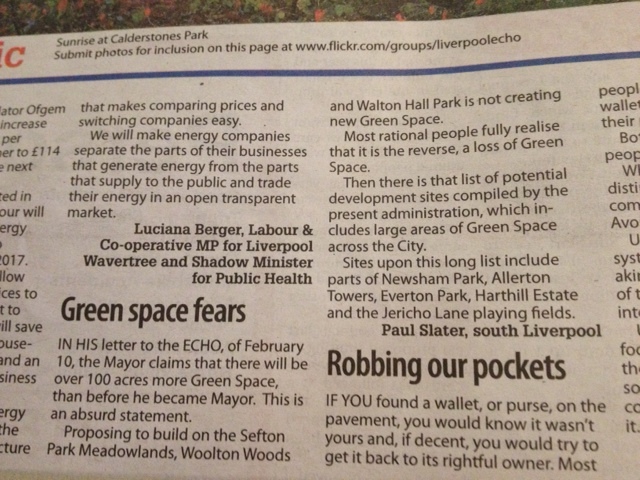 Two more letters from supporters of greenspaces. The council’s Strategic Green and Open Spaces Review Board, chaired by Simon O’Brien, started its public ‘ walkabout’ and meetings. A letter from Meadows campaigner John Davies to alert local people to these meetings appeared in the Echo on Thurs 12th March (in the absence of any off line Council publicity). 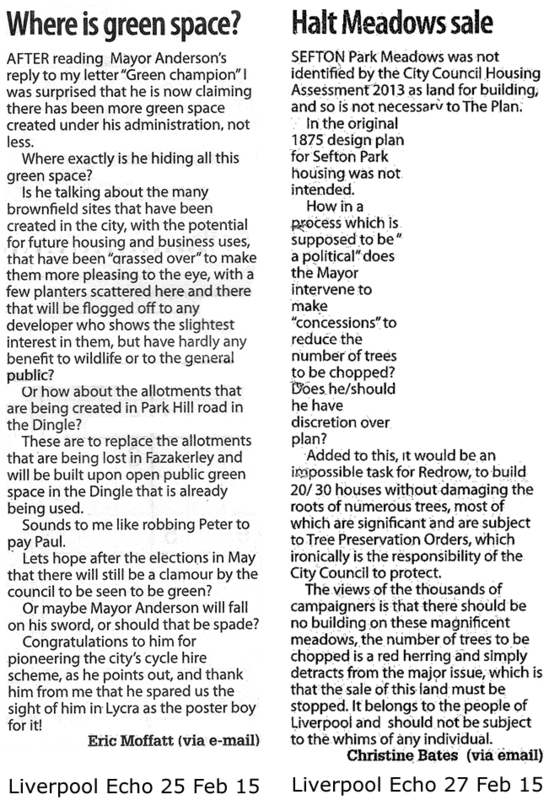 More letters from supporters on Frid 13th March and a comment by Rex Makin in his regular column were also published. Meadows campaigners joined another successful demonstration on Sat 28th Feb at the ‘bombed out church’ in Liverpool by groups threatened by the City Council’s greenspace sell off. This coalition, called ‘Save Our Greenspaces’ (SOGS), includes Save Woolton Woods, Save Walton Hall Park, Keep Calderstones Green, Save Olive Mount Playing Fields and Save Sefton Park Meadows. 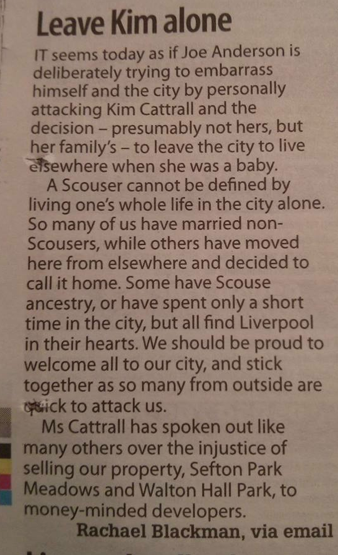 More letters in the Liverpool Echo this month. Over 600 people send in formal objections to the Redrow Planning Application – an unprecedented response. The Feb 19th announcement from Mayor Anderson on another revised Redrow proposal cuts no ice with our campaign. We know that one ‘ mature’ tree loss is misleading and means 22 semi mature and protected trees are still threatened, even with 20 houses. We are still firmly opposed to any development on the Meadows, as a protected greenspace, not suitable for housing. Liverpool Echo 31st Jan reports on our campaign pledge to stop any development on the Meadows, regardless of Joe’s late opposition to tree loss. Kim Cattrall tweets again to ask her followers to SAY NO! See below for our Press Statement on 29th Jan and the Public Notice advert in Liverpool Echo. Listen to Roger Phillips debate 30th Jan with campaign’s own superstar Sandra Warren, and a gentlemen from the Wirral. Start listening at 1hr 26 mins to 1 hr 47mins. We have pledged to continue our campaign to stop any development on the Meadows. Radio Merseyside tweeted our response and give a link to Chair Ken Aspinall’s interview on 28th January. Our 2nd Campaign Release Council Publish Public Notice to local media 28/1/15 alerting local people to Public Notice in Liverpool Echo, giving 3 weeks for objections to 19th Feb 2015. 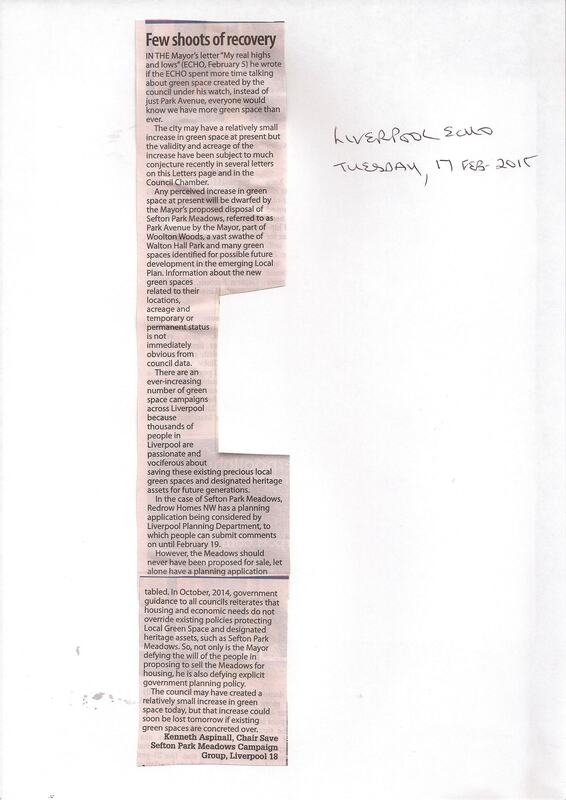 Our Campaign Press Release to Liverpool Echo 23/1/15 on publication of Redrow Planning Application. Liverpool Echo gives first media coverage to Redrow’s planning application for full permission to build 34 large executive houses on the Meadows. 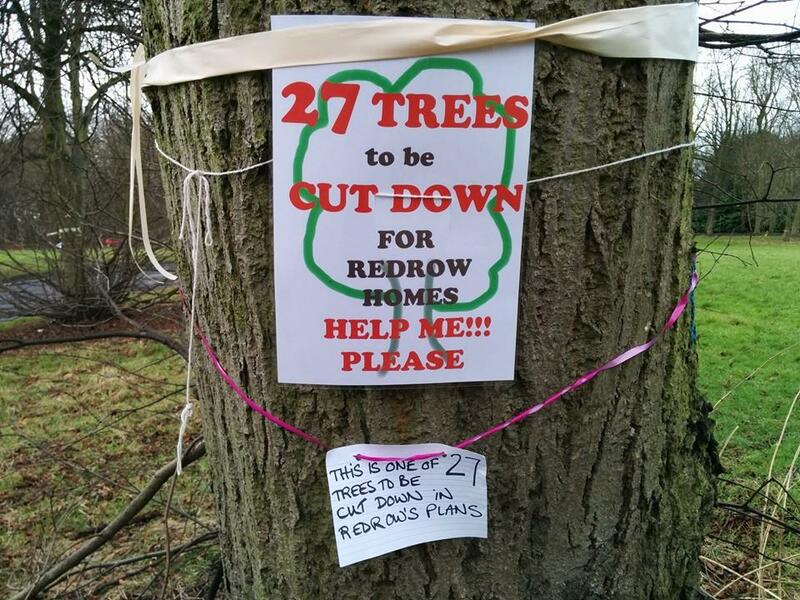 Immediate concern raised is the removal of 27 trees, part of the heritage landscape of the Meadows AND the loss of its Conservation link to Grade 1 Sefton Park. 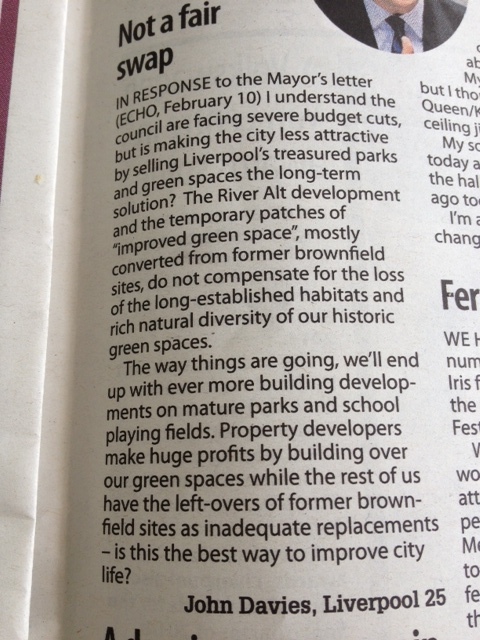 Political Editor of the Independent Jane Merrick, has tweeted her support of Sefton Park Meadows. Jane is originally from Liverpool and knows the Meadows well. John Davies of Save the Meadows campaign published Turning Green To Brown, following his successful Liverpool Biennial exhibition in 2014. £2 of sale from each book supports the campaign. 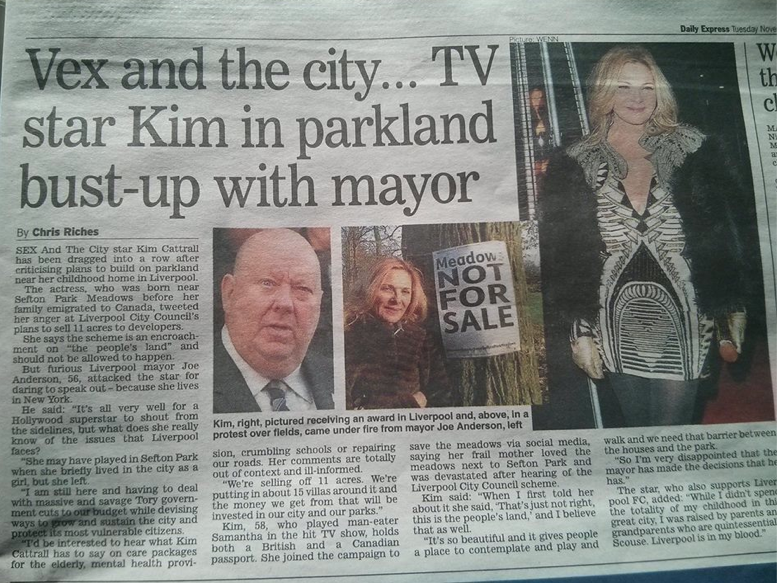 Actress Kim Cattrall has recently given strong support to Save Sefton Park Meadows. She spoke about the Redrow plans to build houses as ” an encroachment on the People’s Land”. 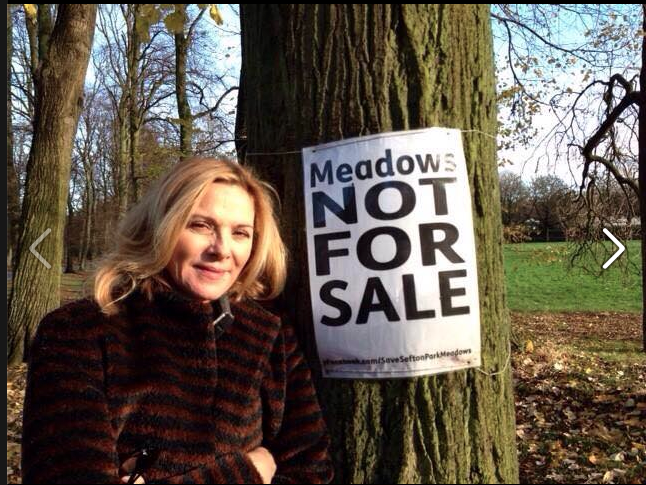 Kim Cattrall gives support to the Meadows campaign. She was subjected to a tirade from Mayor Joe Anderson, but gave back good style! THANKS KIM FOR YOUR SUPPORT! Actress Kim Cattrall speaks up at Liverpool awards ceremony in November 2014. She speaks out about what the Meadows mean to her and her mother, and asking Mayor Anderson to think again.